In his 'Church History', Eusebius (d. 339) attempted to record the history of the Church from the time of the apostles to his own lifetime, arranged according to the reigns of the emperors. Rufinus translated it from Greek into Latin, and continued it to the year 395. It became a standard work of Church history, and was to be found in many medieval monastic libraries. 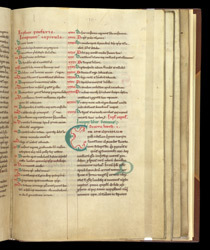 This copy belonged to the abbey at St. Albans. Green was a popular colour for decorated initials in the 12th century, and became uncommon in the 13th century. The use of green ink for headings, as on this page, was always unusual, and is a notable feature throughout this particular manuscript.